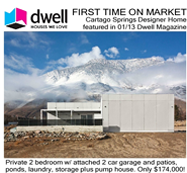 Designer Budget Home Featured In Dwell Magazine! Custom Hybrid Home Featured in January 2013 Dwell Magazine! Completely Furnished & Equipped: Move in Ready! Starting with a custom mfgrd. shell incorporating 9' ceilings, 2x6 R-19 insulated walls, skylights, dual-pane low-e windows & doors. Finished w. cork floors, birch cabinetry, solar-boosted water heat & much more. Integrated 576'sq. garage has power door, attic storage, toilet, sink, washer/dryer, add'l fridge, cabinets & shelving. Main patio is 729'sq. w. poured concrete slab, walls & pool, plus 208'sq. private patio off the master bedroom. 8x12' insulated pump house w. windows, skylight, fan, lights, sink, counters: could use as guest cabin. Well delivers 100gpm of bottled quality water, plus automated solar-assisted landscaping, pond, stream & wetland irrigation. Spacious views surround, from the bordering State Wildlife Habitat to 12,133' Olancha Peak. Low maintenance & automated, it's ideal for a vacation or retirement use. Plenty of room to expand or further develop.